Flavor Text: Long before they were upon it, he knew that it stood abandoned, its weathered stones overgrown with climbing roses. Should work with Dubious Loyalties (IG) or Reek (MotM), too. That's card is GREAT paired with Old Nan. She can give any opponants attacking character the House Bolton trait & kneeling AF sends them back to hand. 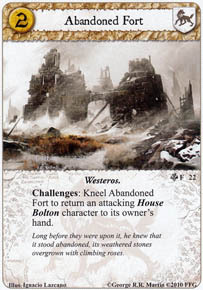 It also helps your own draw to send cheap 0 to 2 cost Boltons back to hand to Marshall next round. If you have The Dredfort out, then your drawing cards again.